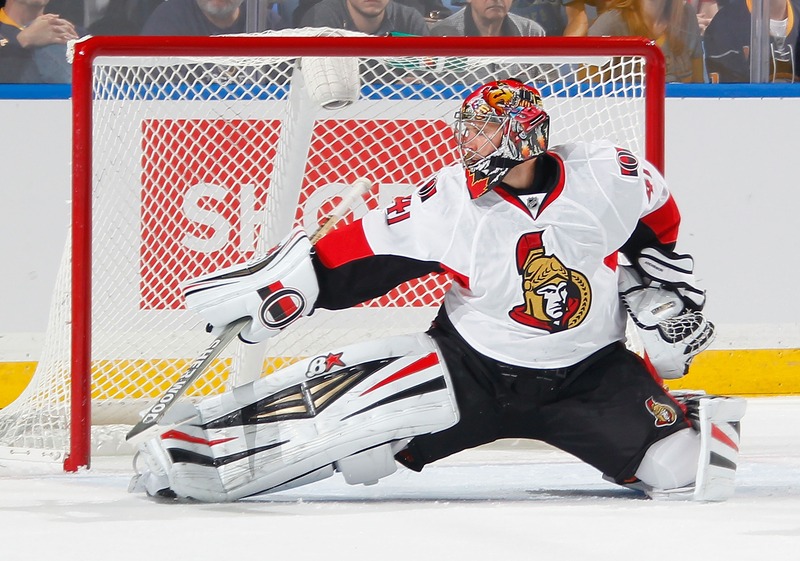 OTTAWA — Craig Anderson gave the Ottawa Senators the kind of goaltending they needed to keep their very faint Stanley Cup Playoff hopes alive. Anderson made 46 saves in his first start after a seven-game absence, good for a 5-3 win against the Chicago Blackhawks on Friday. Erik Condra and Cody Ceci scored in the first period, and Milan Michalek gave Ottawa a 3-0 lead with his 14th goal 23 seconds into the second. Chicago scored two goals later in the period before Ottawa center Kyle Turris scored a power-play goal 6:00 into the third to put the Senators up 4-2. Clarke MacArthur scored at 10:54 to increase the lead to 5-2 and tie Bobby Ryan for the Senators’ lead in goals with his 23rd. MacArthur had a goal and two assists. Blackhawks defenseman Brent Seabrook scored a shorthanded goal with 3:00 left. Patrick Sharp scored a power-play goal midway through the second period to draw Chicago within 3-1 before Anderson made a sensational left-pad save on Andrew Shaw‘s scoring chance from the edge of the crease. Former Senators forward Marian Hossa scored with 41 seconds left in the second to draw the Blackhawks within 3-2. Goaltender Antti Raanta made 24 saves in his first start in six games for the Blackhawks, who on Thursday were shut out for the second time in three games, a 3-0 loss to the Boston Bruins in Chicago’s first game at TD Garden since it won the Stanley Cup there last spring. The Blackhawks, who lost for the third time in four games, would have clinched a Stanley Cup Playoff spot with a win or a point from an overtime or shootout loss. They also could have clinched if the Dallas Stars lost to the Nashville Predators, but the Stars won 7-3. “I didn’t like our game tonight,” Blackhawks coach Joel Quenneville said. “We had a good start, and obviously giving up a shorthanded goal right off the bat, they got some momentum off it and they played well, and they got [goals] late in the period and early in the second, and we were down 3-0. Chicago (42-18-15), which has seven games remaining, is in second place in the Central Division with 99 points, eight behind the first-place St. Louis Blues and one ahead of the Colorado Avalanche. St. Louis and Colorado each have two games in hand. The Senators won for the second time in three games (2-0-1) following a four-game losing streak. Ottawa (30-29-14) moved past the Carolina Hurricanes into 12th place in the Eastern Conference with 74 points. Condra opened the scoring with a shorthanded goal at 9:25 of the first period after MacArthur was sent off for goaltender interference when he fell on top of Raanta. Raanta later injured his right leg when he fell awkwardly at 12:50 of the first. Corey Crawford got ready to come in, was on the ice to stretch, but Raanta remained in the game. Crawford had appeared in 27 of Chicago’s previous 32 games since missing 10 from Dec. 10-30 because of a groin injury. Ceci made it 2-0 with his third goal of the season with 30 seconds left in the first period. Senators forward Chris Neil and Blackhawks defenseman Niklas Hjalmarsson each went down to the ice briefly after their legs collided at 16:32 of the second period. Shaw was given a major penalty for spearing Zack Smith, a game misconduct and a roughing minor at 14:33 of the third. Smith got minors for slashing and roughing. Blackhawks left wing Matt Carey made his NHL debut. Carey signed with the Blackhawks as a free agent after his freshman season at St. Lawrence University. Ryan had season-ending surgery Thursday in Montreal. The forward, who had 23 goals and 25 assists for 48 points in 70 games, missed Ottawa’s previous two games because of a sports hernia injury he aggravated in a 3-1 road loss to the Stars on Saturday.